Thoracic THURSDAY!! It’s Thursday so why not talk about the Thoracic spine?!?! Your thoracic spine (mid-back) is the longest region of your spine, made of twelve different vertebrae that span from just below the base of the neck (cervical) to the stomach region (lumbar). This section of the spine plays a crucial role in overall function of the body, not only protecting a large portion of the spinal cord but also anchoring down the ribs so they can protect the heart and lungs. 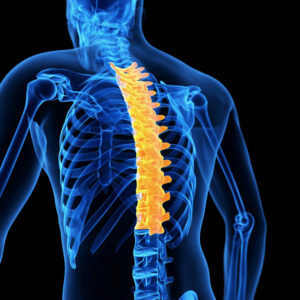 It takes very little to push one of your spinal vertebrae out of alignment, whether it’s a physical accident, stress/tension in the body or simply hunched over at your desk working at the computer. It’s part of life! That, however, means that you’re vulnerable to a misalignment, known as a subluxation. While a healthy vertebra with no misalignments protects the spinal cord, a subluxated vertebra can put pressure on the spinal nerves, disrupting the messages that are supposed to flow from the brain to other organs in the body. This, in turn, can affect the function of various areas of the body—some you may not even expect! Take a look at each vertebra and how it connects with different organs and areas in the body. And most importantly, identify any possible symptoms that could arise from a subluxation in that vertebra! Using your cellphone all wrong? Why am I sore after an adjustment?